When looking at autoethnography the most important element to look at is how our own culture influences how we experience another culture. What are the experiences that I’m drawing from to make sense of Gyaru culture? I’ve always been interested in fashion, probably more so in my high school years, when I attended Tafe where I studied fashion design. So studying fashion trends is something that I’ve always been fascinated about. My first impression of the Gyaru style was WOAH! That’s a lot of makeup and colour; I don’t think I could ever walk outside of the house wearing something so intense and bright. However After taking a step back and looking at the reasons that they enjoy dressing in such a style, such as the confidence it gives them and sense of pride to belong to the Gyaru subculture, it dawned on me that it may not be to the same extent but the way I dress and apply my makeup gives me a sense of confidence when leaving the house each morning. Something I noted in my previous post is how Gyaru’s identify with each other through aesthetics, adding to my assumption that Gyaru is a very material based culture. But we all to some level do the same thing identifying with each other by the way one looks, dresses, and grouping together with people that are similar to ourselves. Reber, Schwarz and Winkieman (2004) look at this “relationship between beauty and various aesthetic judgments, such as judgments of preference and judgments of aesthetic value”, being attracted to people that look like ourselves. It was clear to me in my initial research that Gyaru’s motivation was more then just fashion they are making a statement for or against something. After further research I discovered that school uniforms are worn inside and outside of school hours; the sailor style uniform was introduced in japan in the 1920s (Tokyo girls update, 2015). The uniform styles were originally designed based on old European military uniforms since then there have been modifications to the uniform while still maintaining the sailor style. These uniforms representing Japanese conformity and self control (Dave LaSpina, 2007). Dressing in sailor uniforms also contributed to the Jap anese Kawaii (cute) culture. 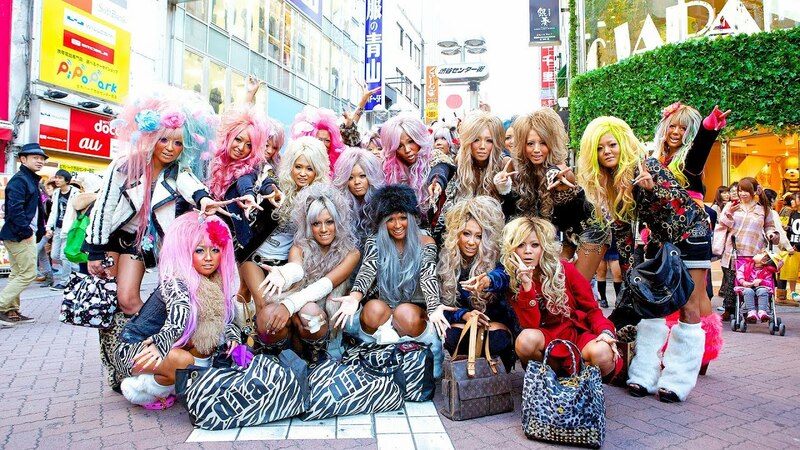 Dressing Gyaru was a way of rebelling against the sailor style that represents tradition and conformity. Fashion designer Keita Maruyama explains that they are “breaking from the reserved looks of the past, wearing things not for boys but for themselves.” Making a statement that prim and proper is a thing of the past. By modifying the school uniform and wearing the Gyaru style they are displaying their independence and power as young people. Being able to wear whatever you want and present who you are as a person through fashion is something that people of all culture can relate to. I remember in school wearing bright shocks and shoes, which was against the rules but I enjoyed looking different to everyone else. Even if it was just my shoes. Maruyama also discusses the inspiration of Gyaru and how it’s turned into something different and special they “wanted to look like black people but in the process have created something completely new”, a style that was influenced by western cultures has become recognisably Japanese. “An autobiography should be aesthetic and evocative, engage readers, and use conventions of storytelling such as character, scene, and plot development” (Ellis, 2011). My blogs will hopefully fulfil this storytelling convention to show my journey of the development of my understanding Gyaru’s and all the different elements that contribute to their culture. The more I read into about the culture and the motivations for being a Gyaru, the more I realise its more then just lots of makeup and bright clothing. I’m super excited to experience and write about this culture, telling my journey of understanding it. I’m looking into fashion for my assignment, specifically all different types of Japanese fashion and how people in Western countries are able to wear the clothing styles and how accessible they are. The Gyaru style reminds me of Geordie Shore! The hair and the fake tans! I will be following your blog posts for sure. It’s good to see someone else is looking into fashion, especially as Japanese fashion varies so widely. Gyaru might have to be a style I look into as it appears to be very Westernised compared to some of the other big trends.